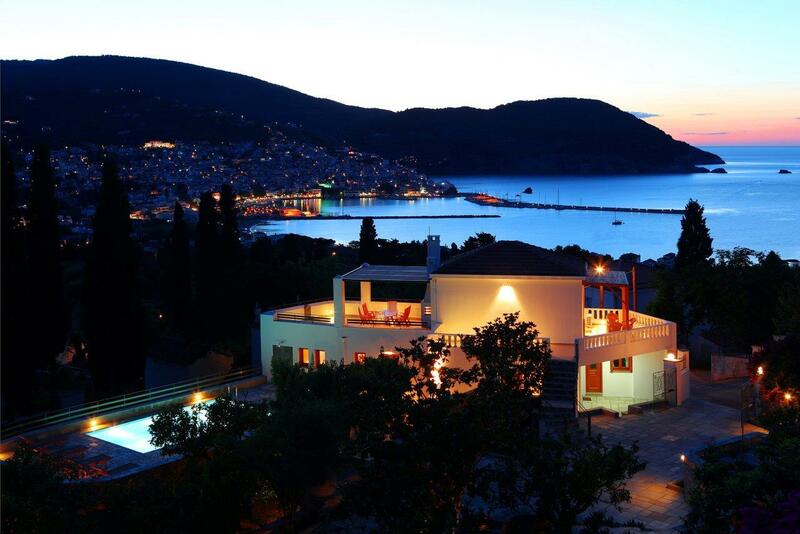 Please contact the owner before booking. 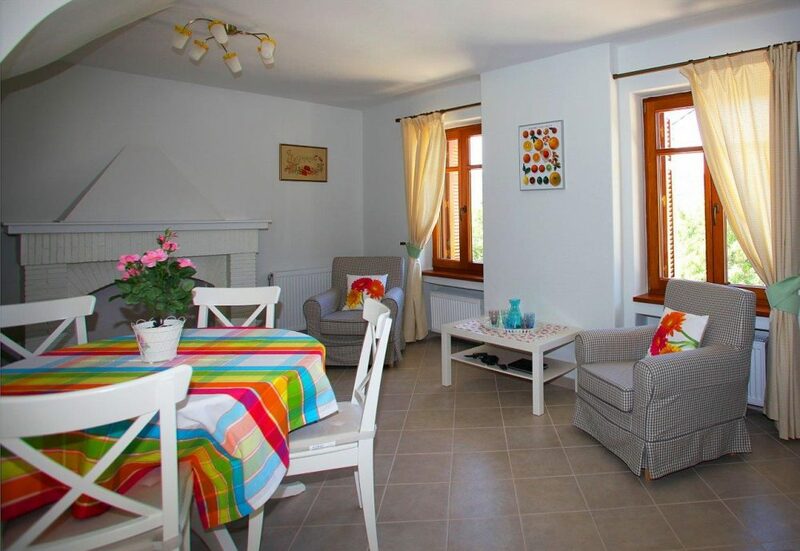 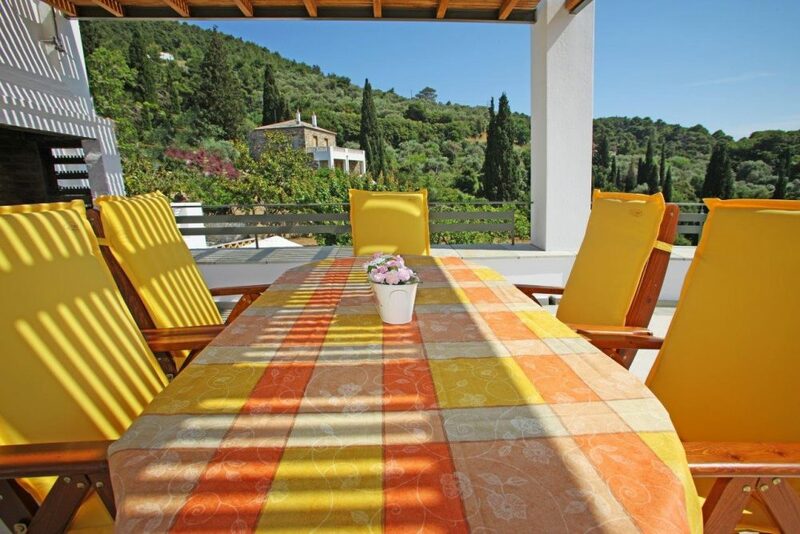 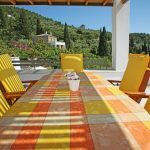 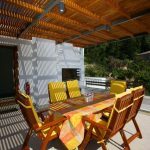 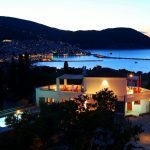 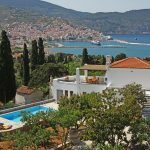 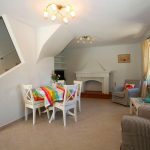 Villa Orange & studio (ideal for 6-9 guests) is in Skopelos island, Aegean sea, peaceful, safe.The local population is greek, english, french and german. 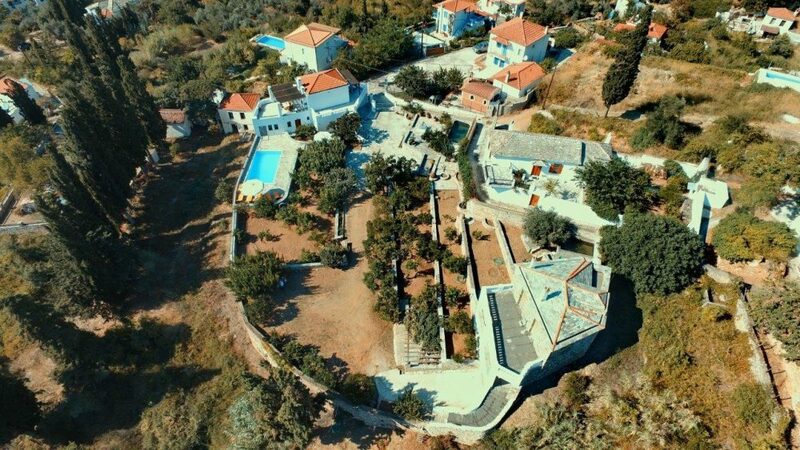 The island is the greenest island of Greece, no violence (no burglaries at all, totally safe to walk in the night for women and kids).The villa is on the hill (10-15 min walk from beach, old town, port,restaurants and bars).It is a totally new villa with air conditioning in all rooms, ceiling fans, heat isolation,double glazing windows &private pool of dimensions of 7X4 m. and a depth which goes from 0.90 m to 1.80 m. Villa Orange stands, not just on a plot, but IN A GARDEN FULL OF flowers and fruit trees. 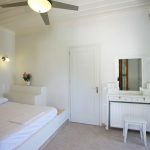 The villa and the studio flat of the villa sleep 6-9 guests (5-6 guests in the main villa and 2-3 guests in the independent studio of the villa with separate entrance). 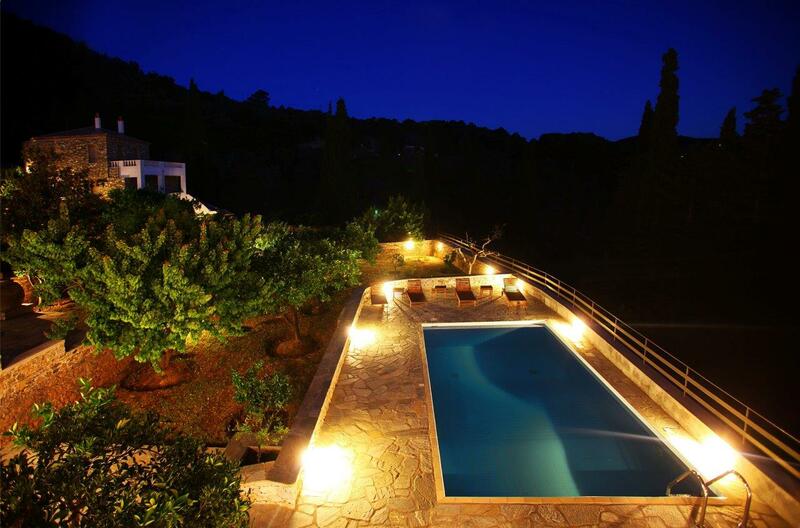 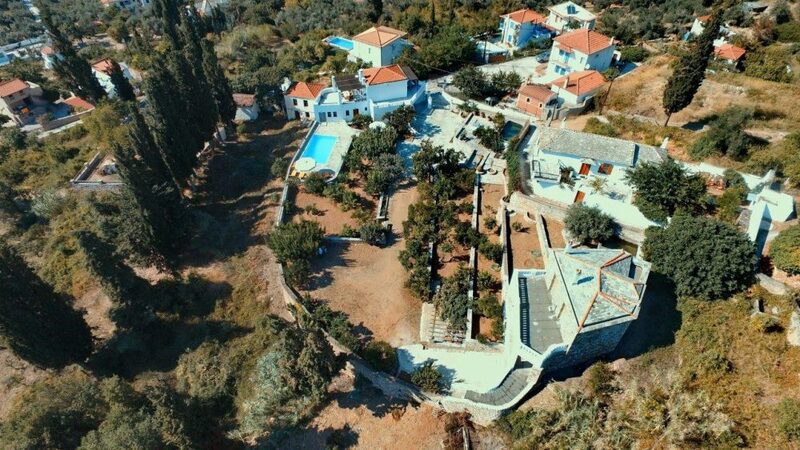 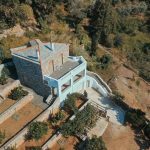 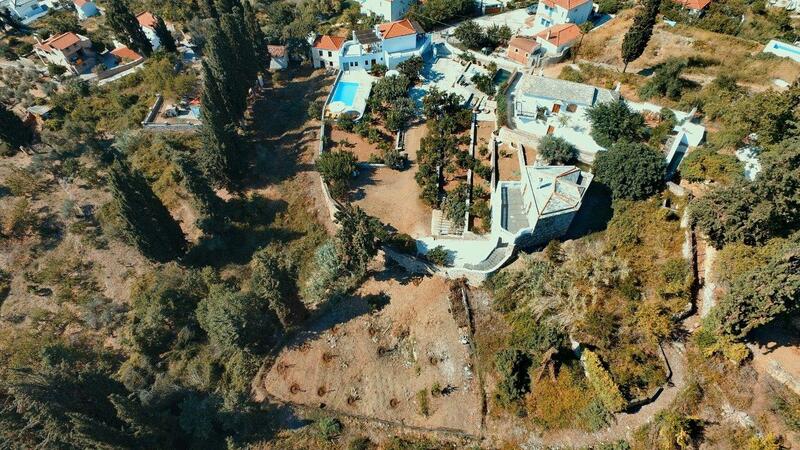 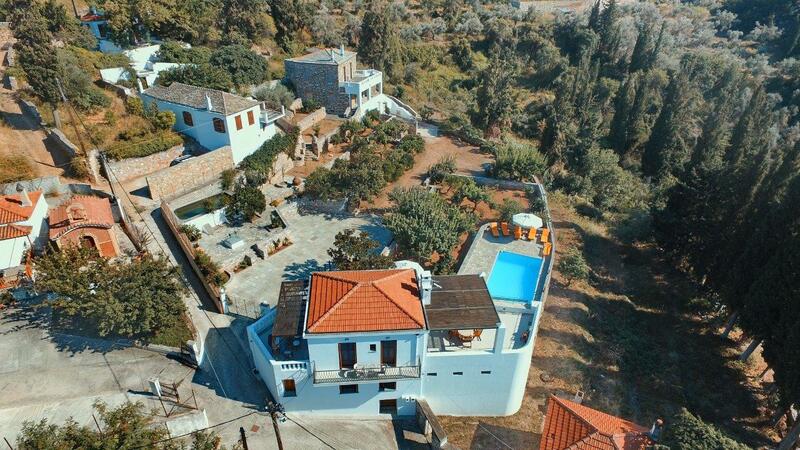 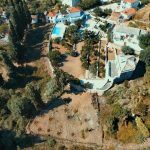 The villa stands in a natural declared resort, where you only hear the song of the birds,while it lies ONLY 10-15 min.walking distance from the town of Skopelos and closest beach and 5 min by car, from hospital, pharmacy, tavernas, restaurants, renting office of cars, supermarket. Ideal for tourists without car. 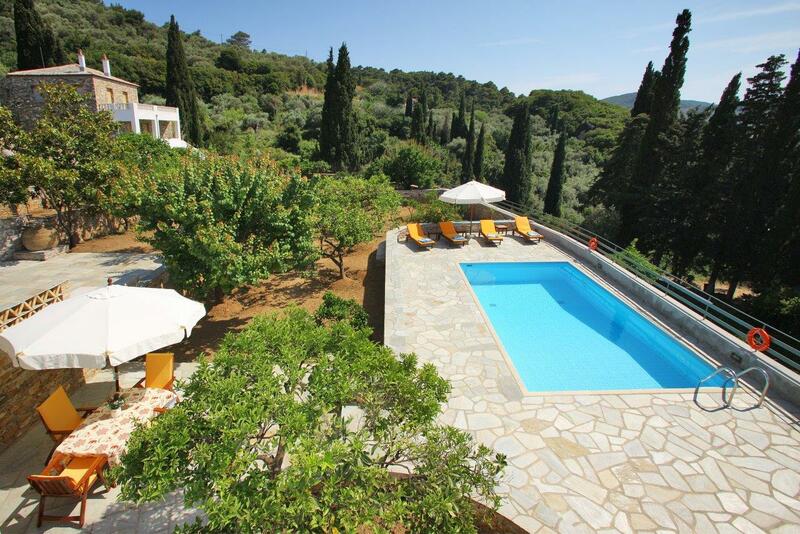 The garden is so taken care that guests may walk without shoes, if they wish. 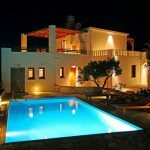 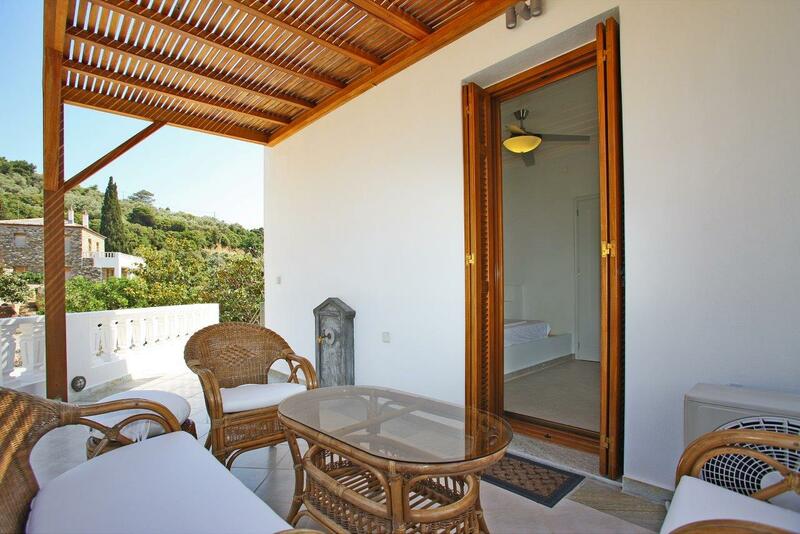 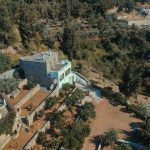 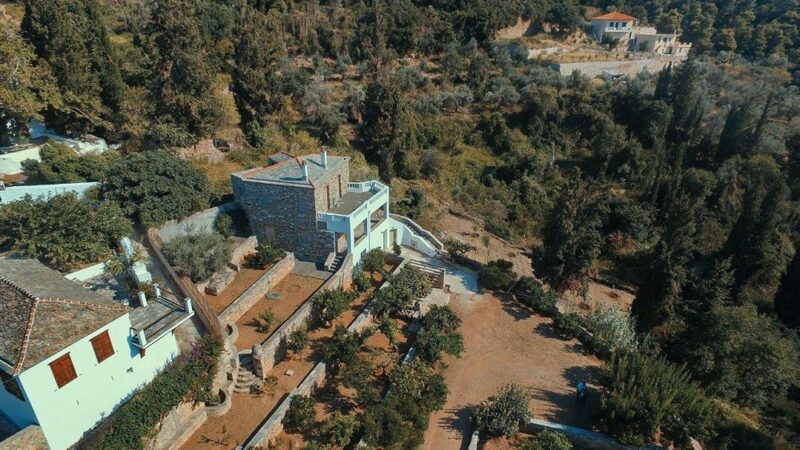 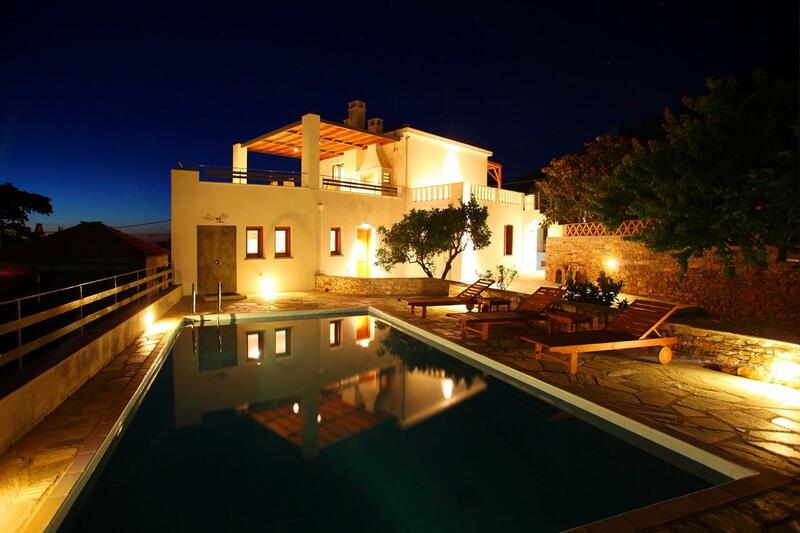 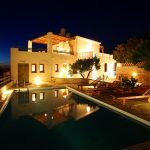 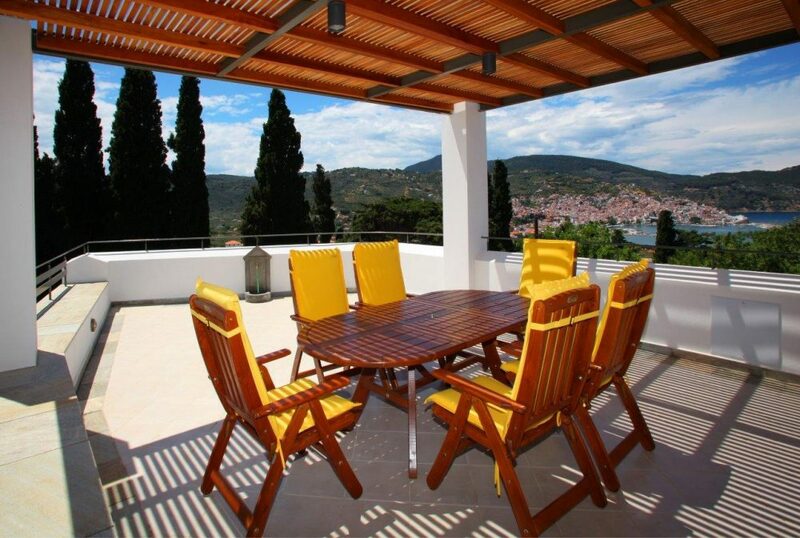 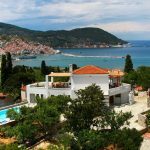 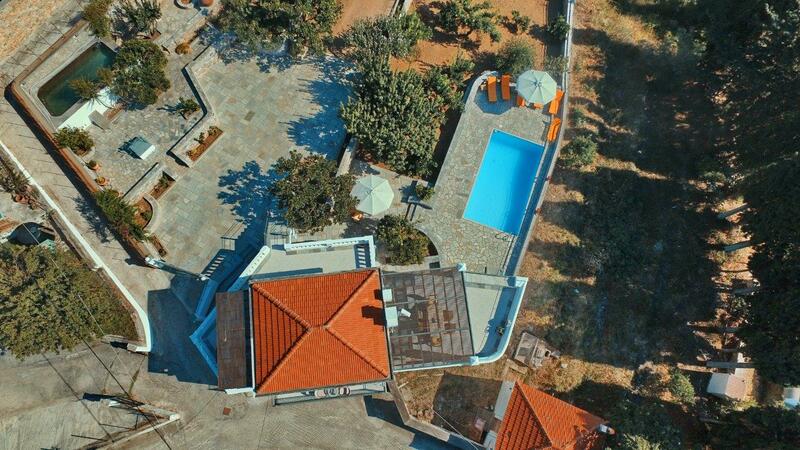 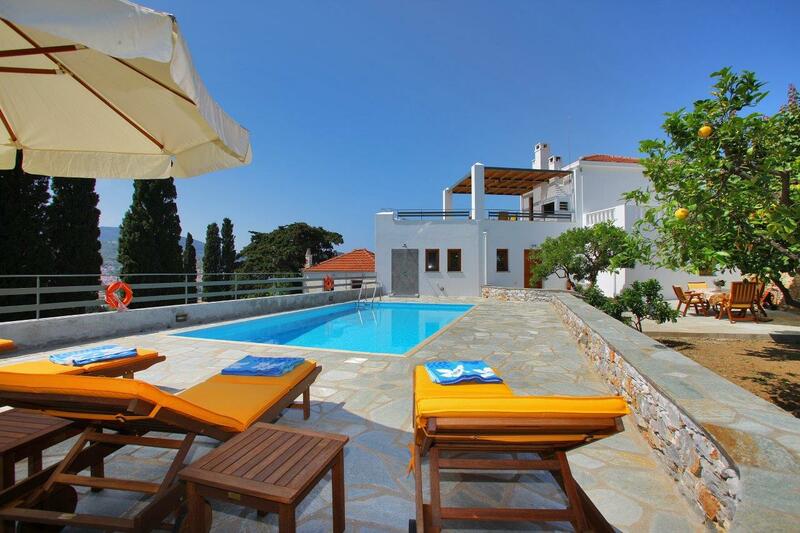 Villa, studio and garden have magnificent views over the island and sea.The house has been designed and constructed by the owner who is civil construction engineer according to the traditional character of the island. 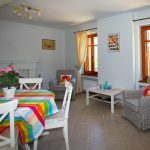 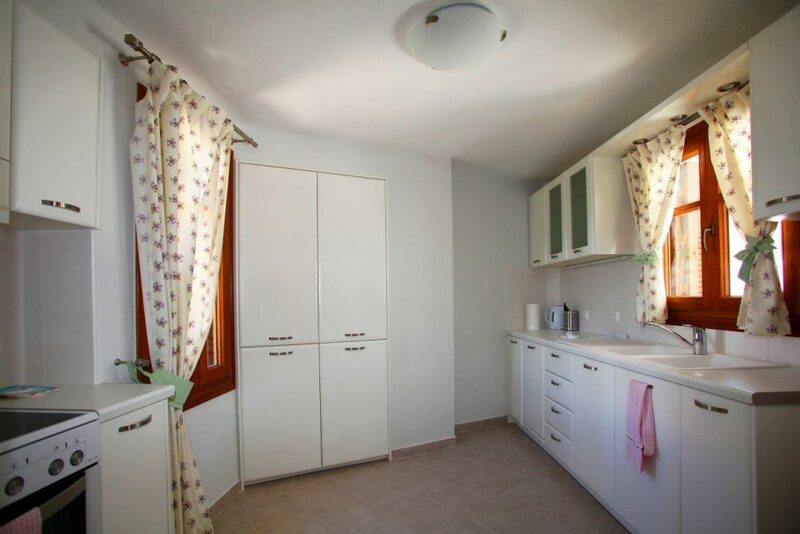 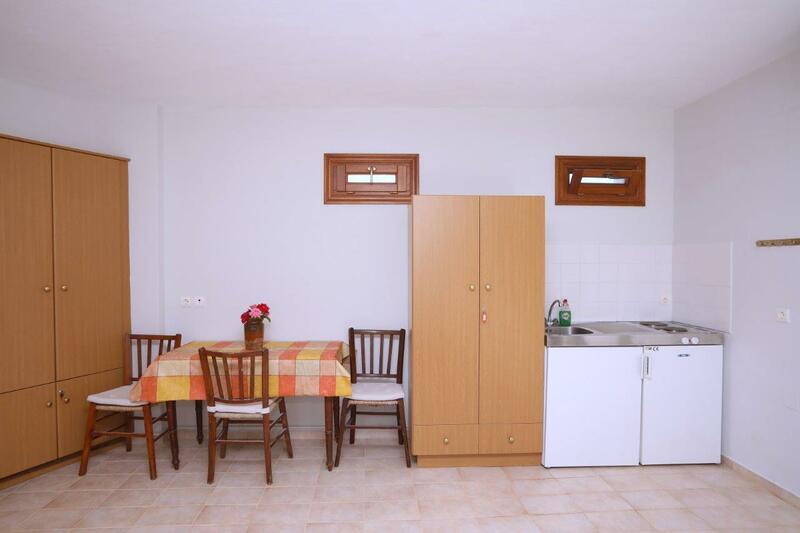 The external and internal decoration has been carefully designed with a classic and romantic style by the owners.All the equipment of the house and the garden are totally new , including new furniture, curtains, warehouse, electric appliances . 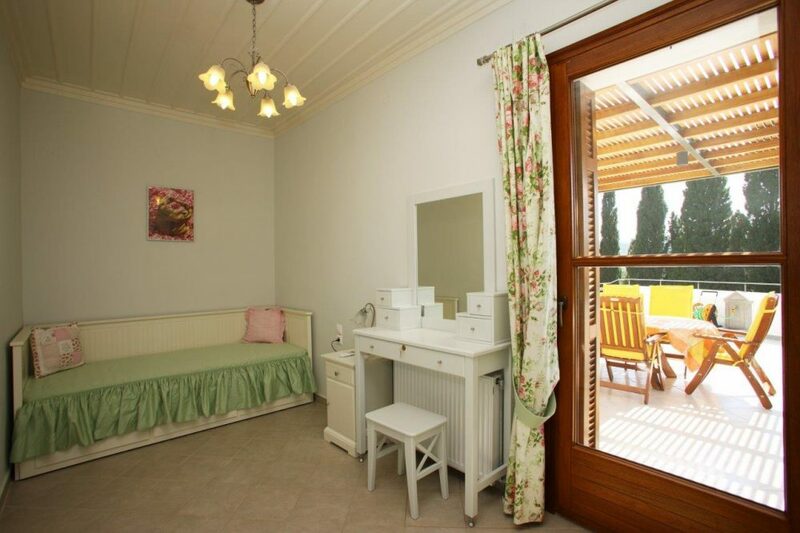 All linen, orthopedically mattresses, cushions, towels, curtains are new. 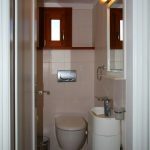 The house has 2 floors and the studio 1 floor and they host 7-8 people.Ground floor has living room, kitchen, bedroom with double bed, bathroom with shower. 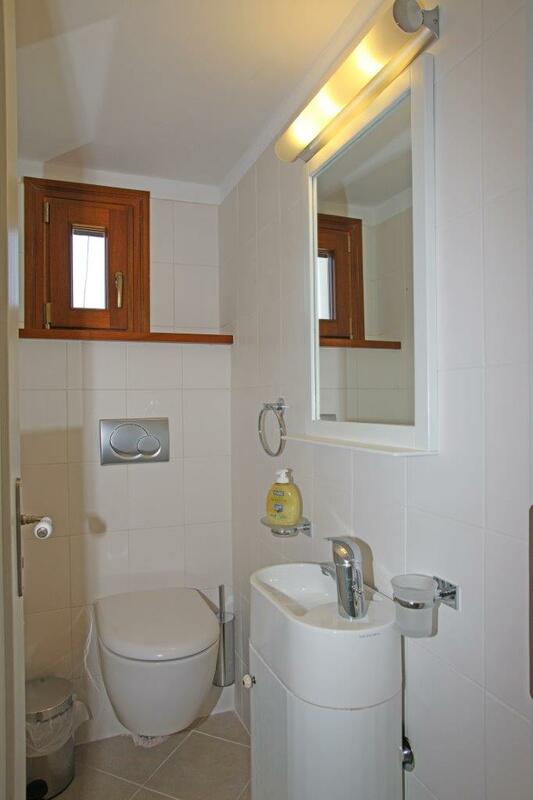 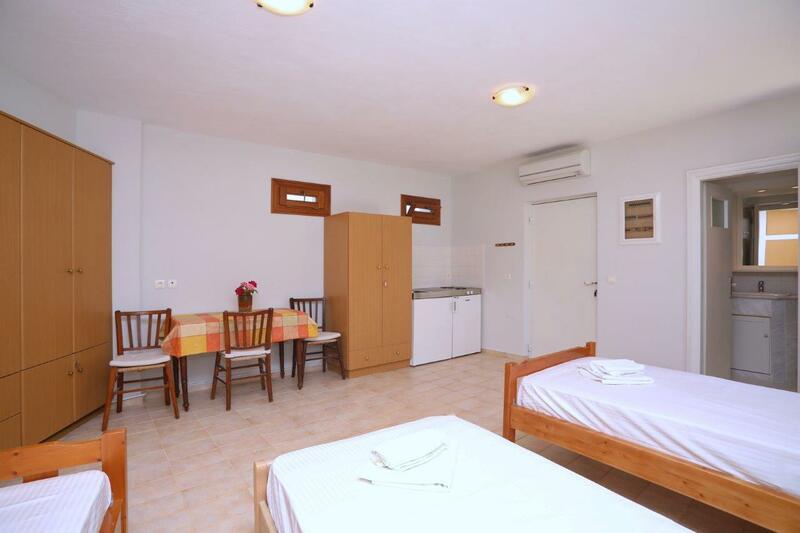 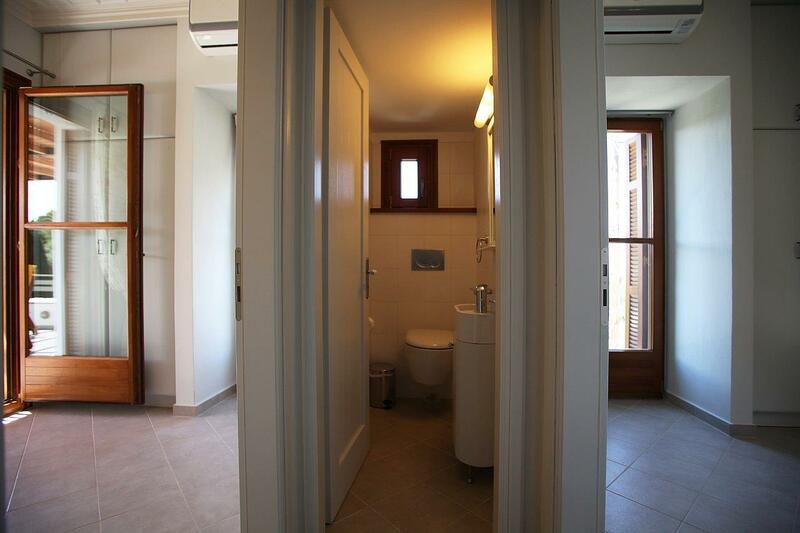 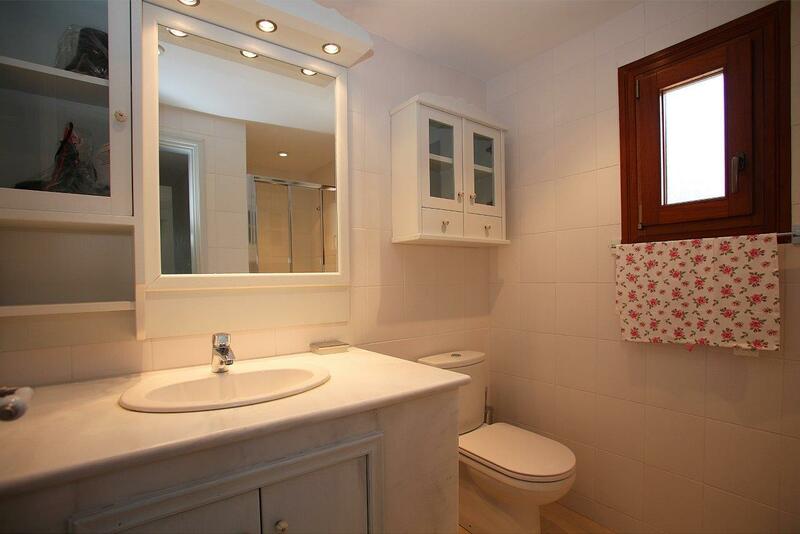 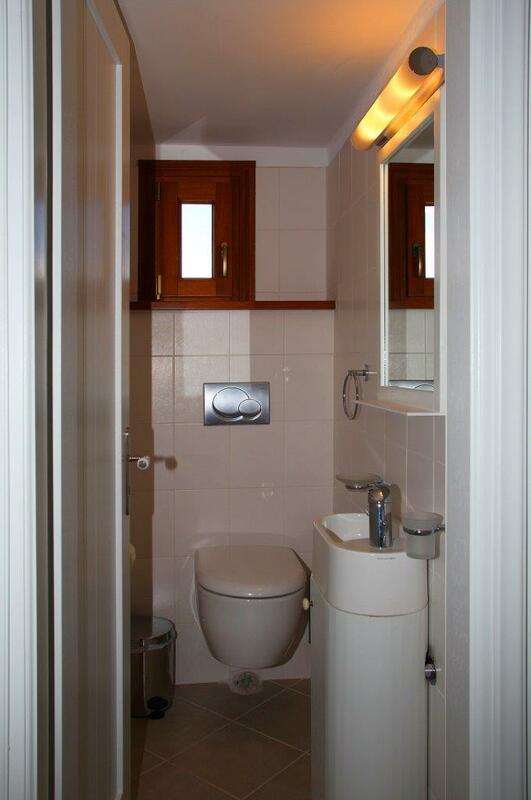 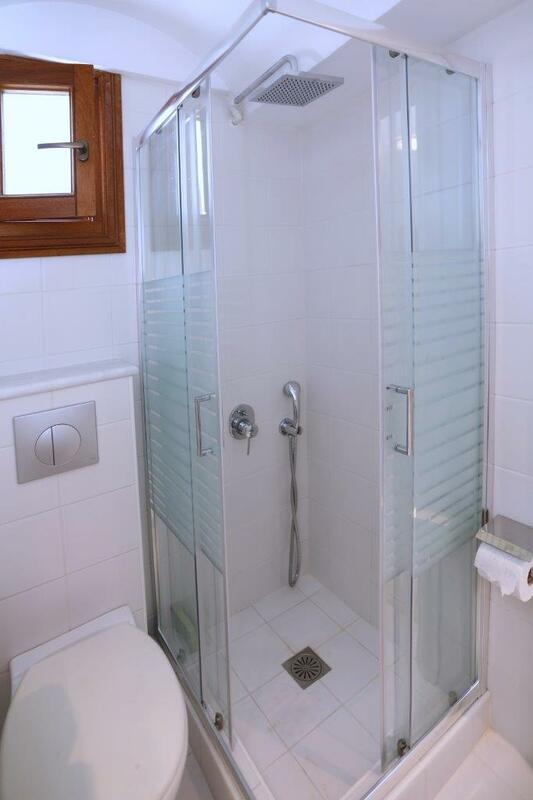 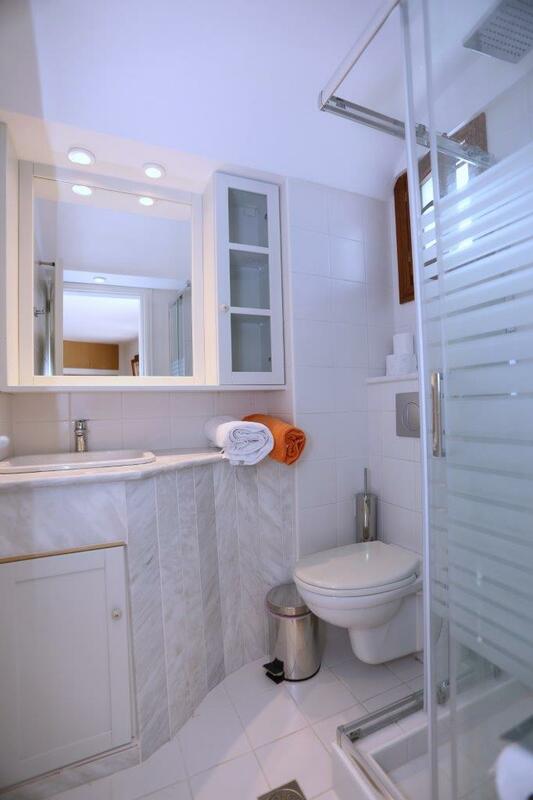 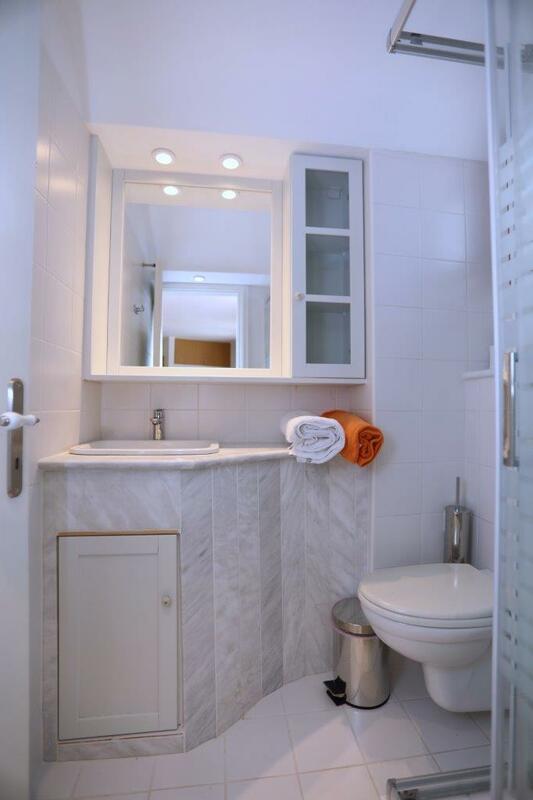 First floor has 2 bedrooms (one with double bed &second one with 2 single adjacent beds) &one WC. 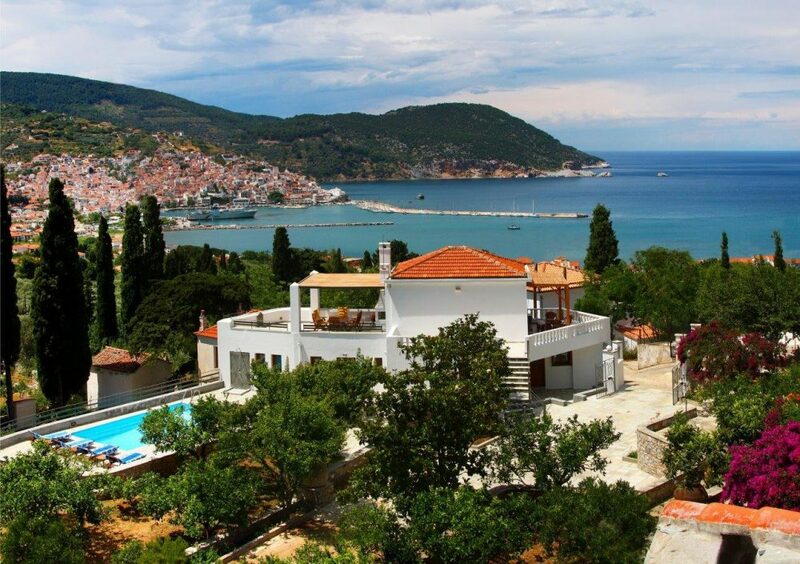 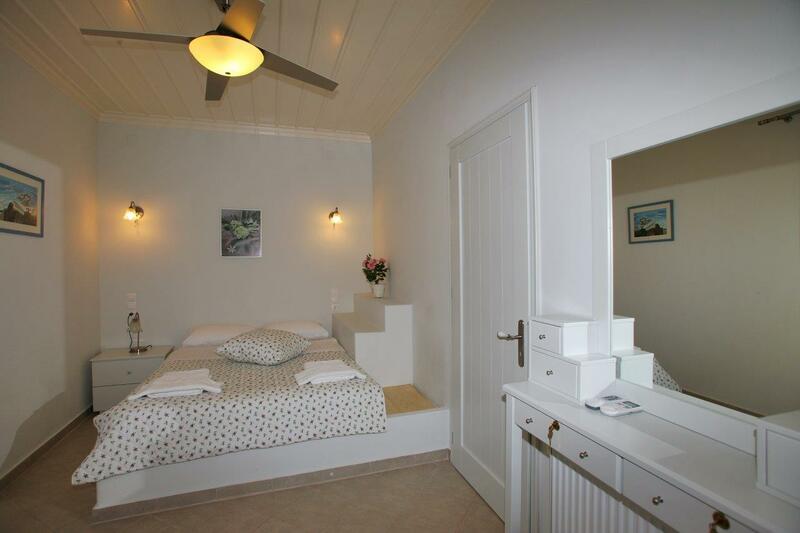 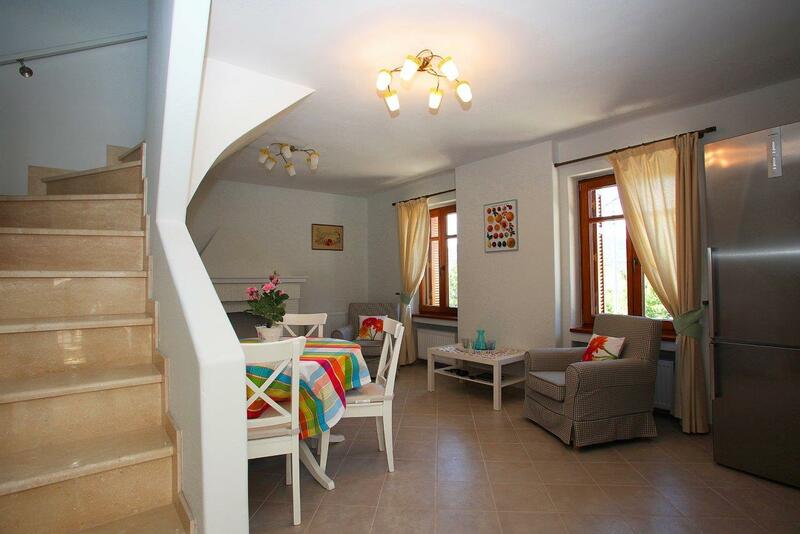 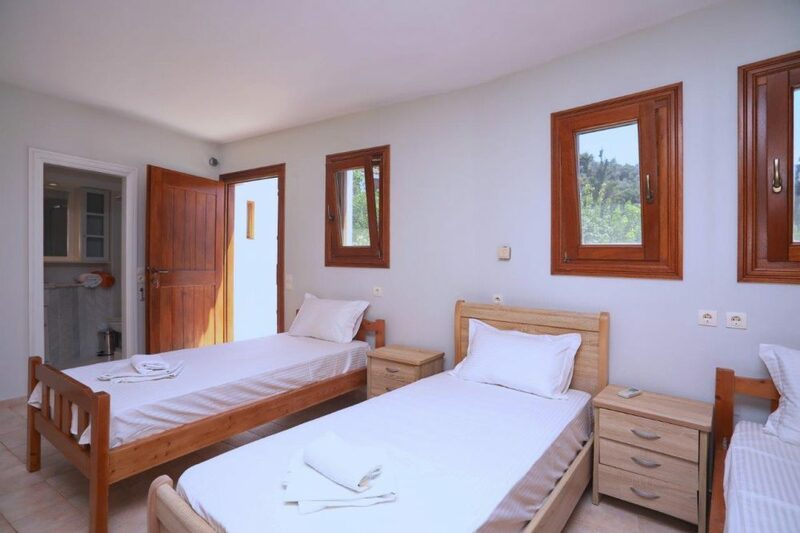 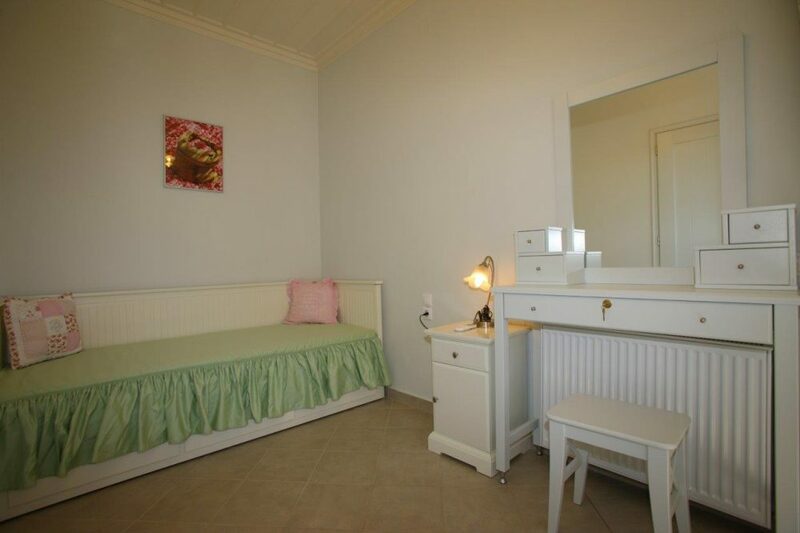 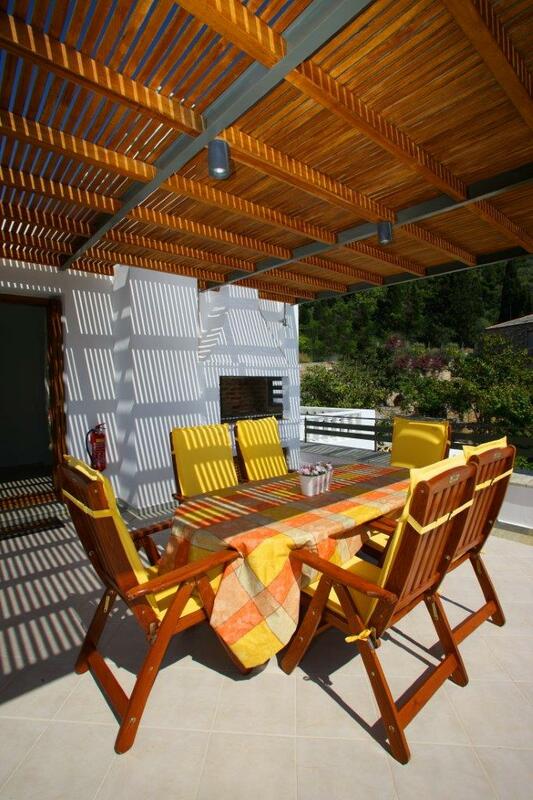 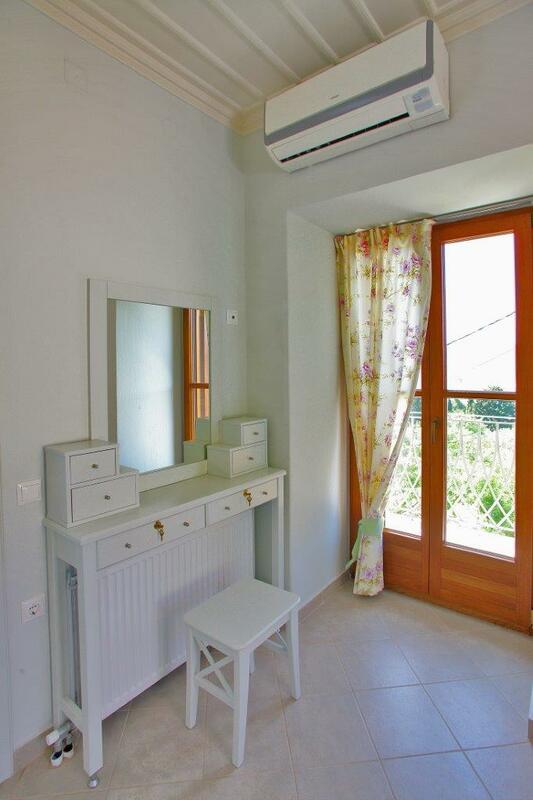 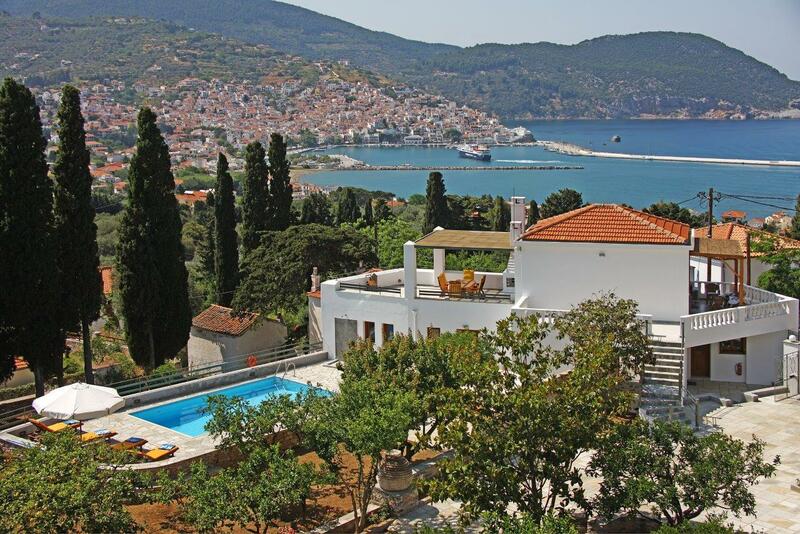 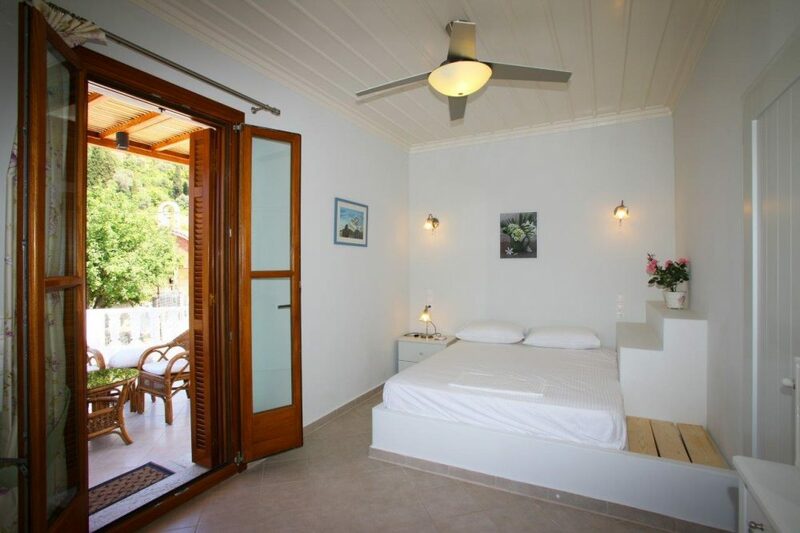 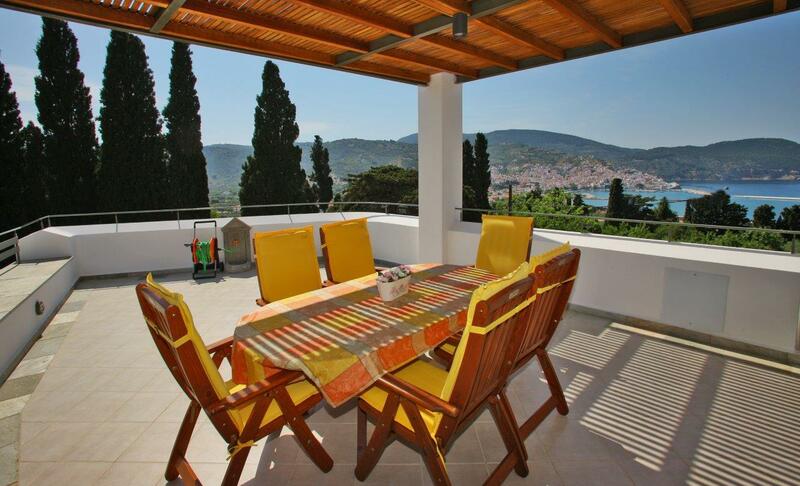 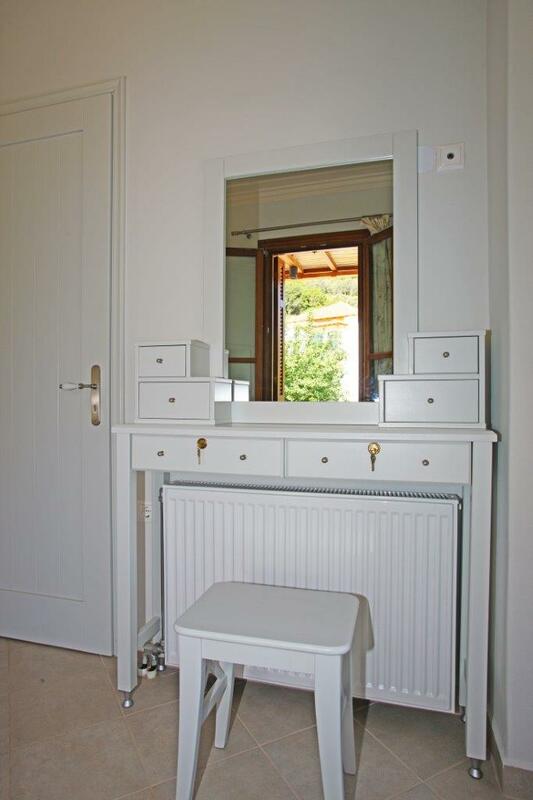 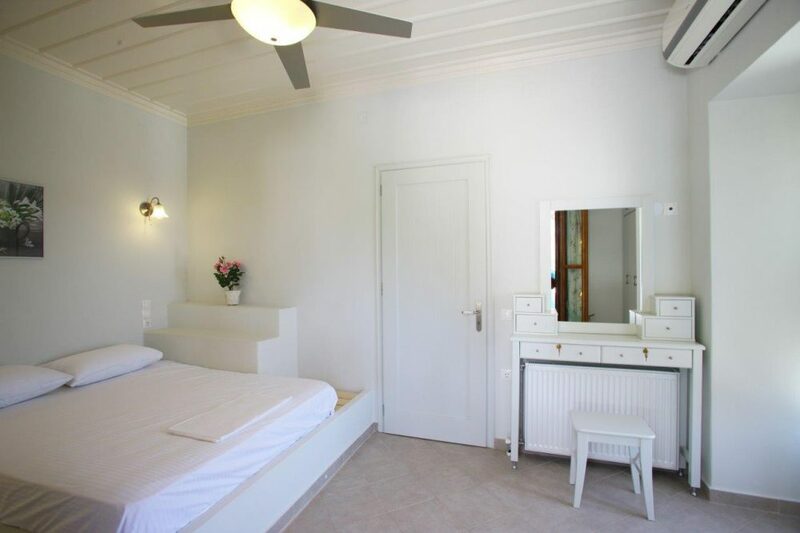 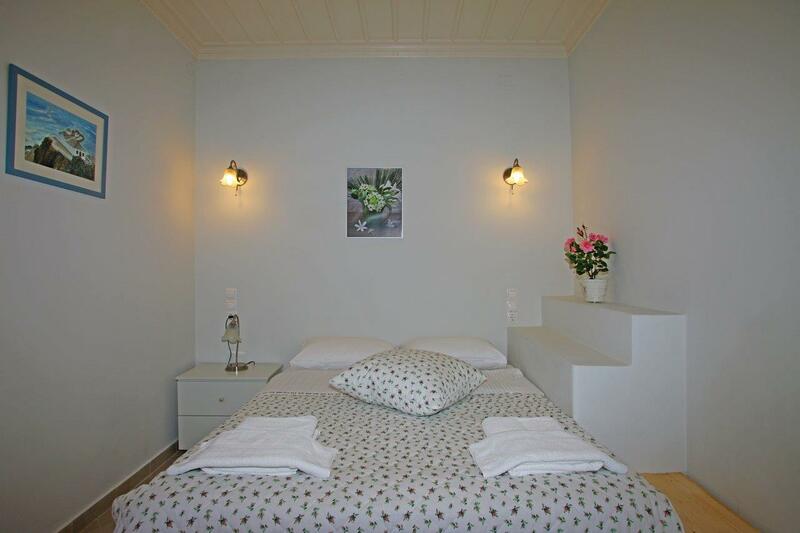 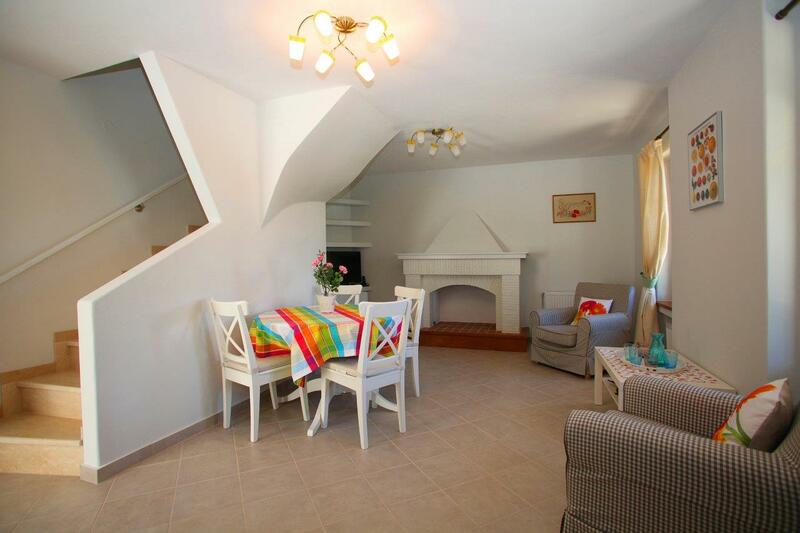 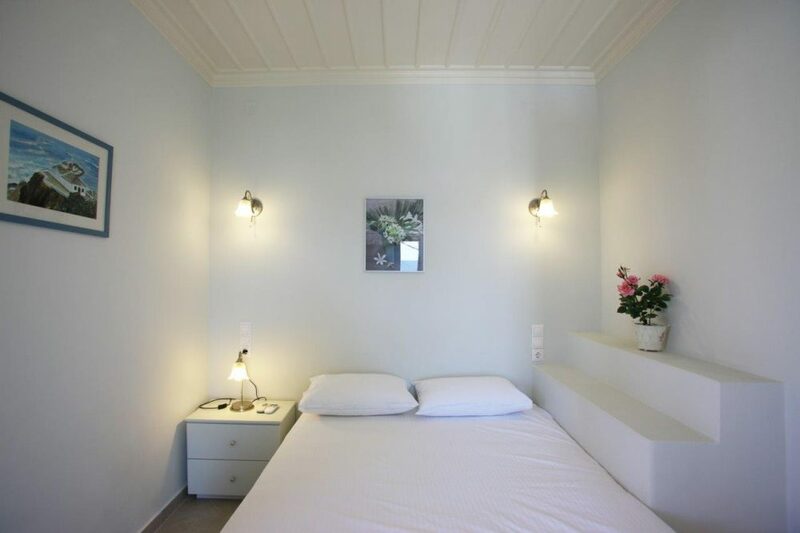 Each bedroom has its own private terrace & dinning furniture (splendid view over the Aegean sea,Skopelos town). 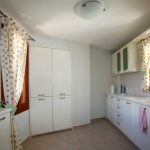 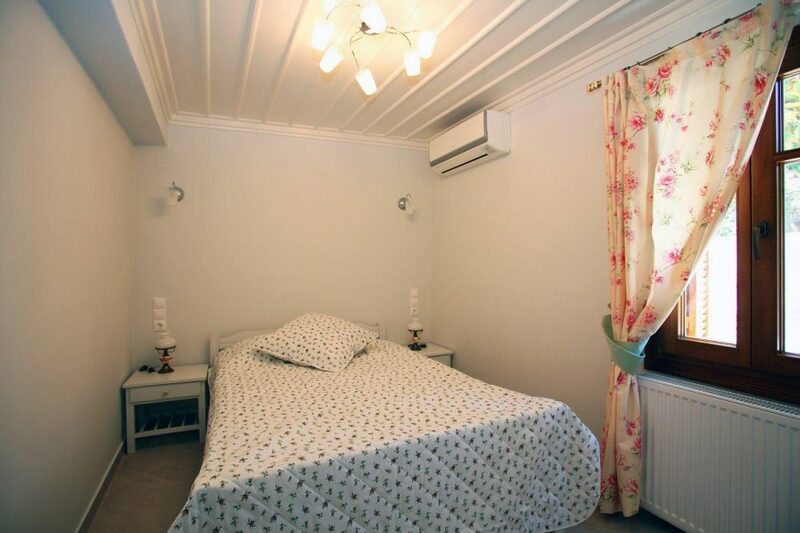 Second bedroom with single beds goes out in a big terrace of 45 sq. 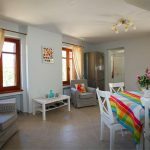 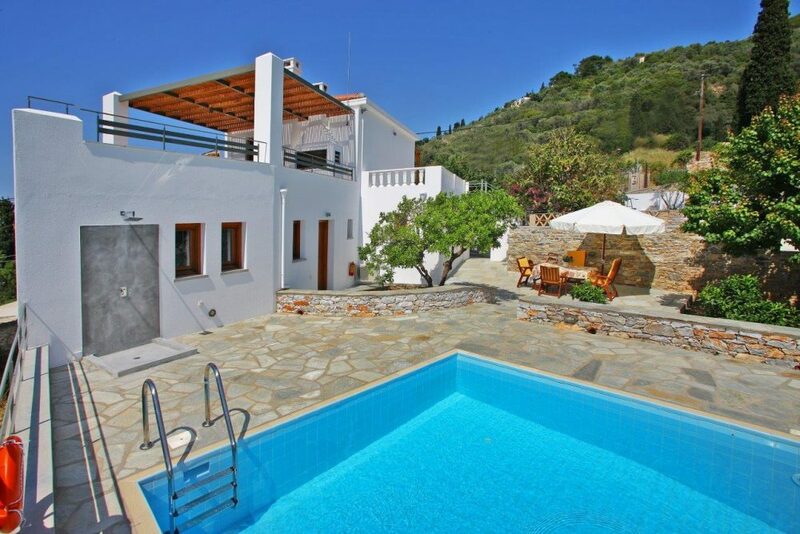 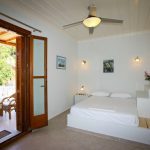 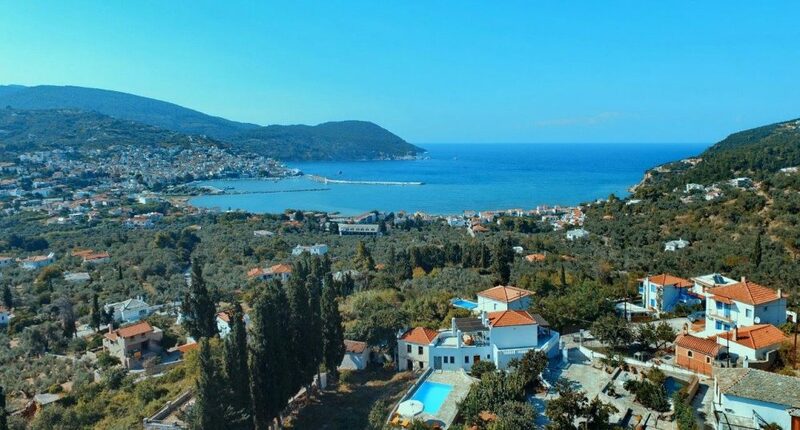 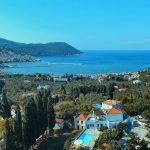 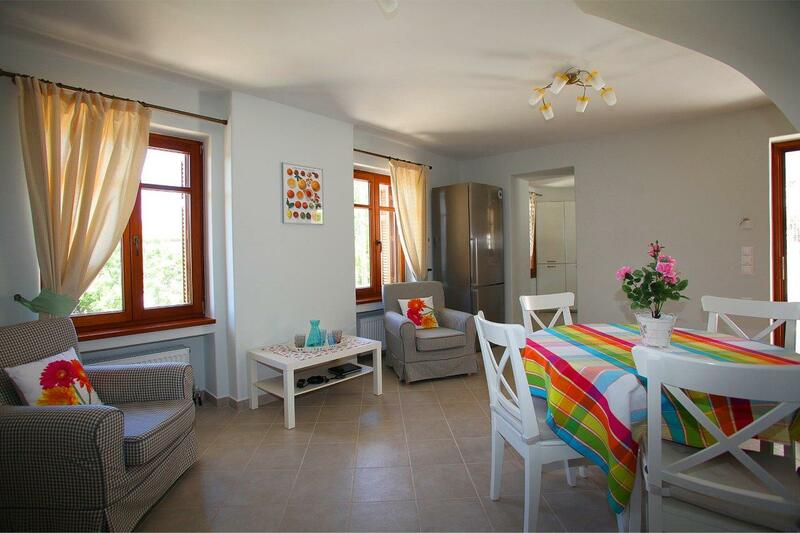 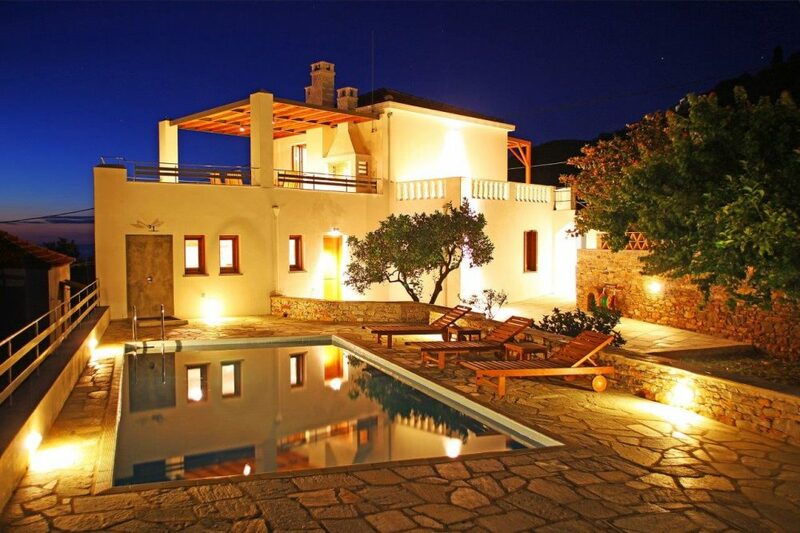 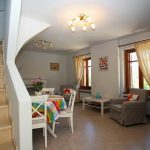 (west orientation, splendid panoramic view over Aegean sea, harbor,Skopelos town, the garden, swimming pool.Terrace has wooden pergola,built in barbecue, dinning furniture.First bedroom with double bed goes out in big terrace of 35 sq. 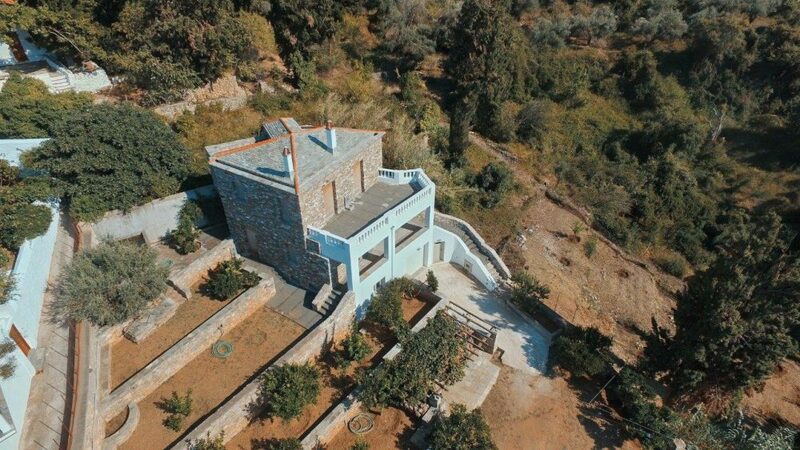 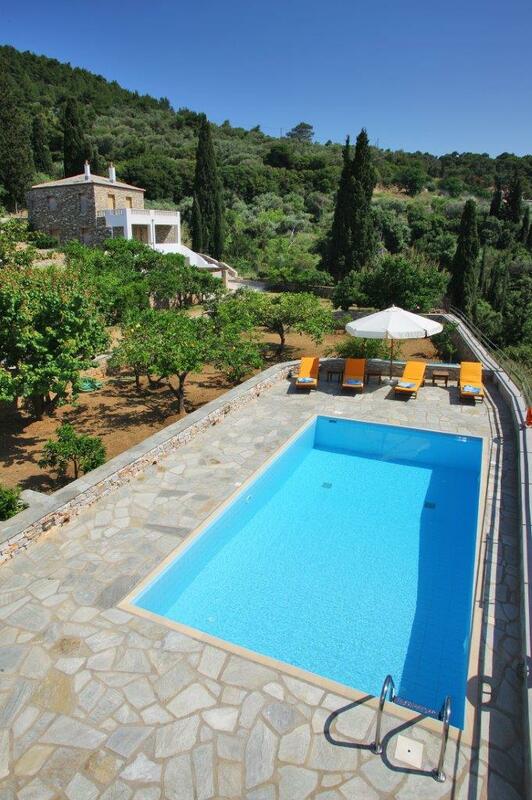 (east orientation, overlooking garden & Aegean sea. Fenced neat, tidy garden 2200 sam, all illuminated.The studio flat (30 sqm) stands next to the villa and in front of the pool ( view to the pool and garden) fully equipped with kitchenete (electric cook and fridge), plenty of cupboards air condition,new shower, toilet,cupboard.We offer to the guests free of charge following bio products from our land (honey, marmalade,olive oil, tomatoes, zucchini, aubergine, cucumbers, lemons, 2 bottles of wine, 2 bottles of mineral water). 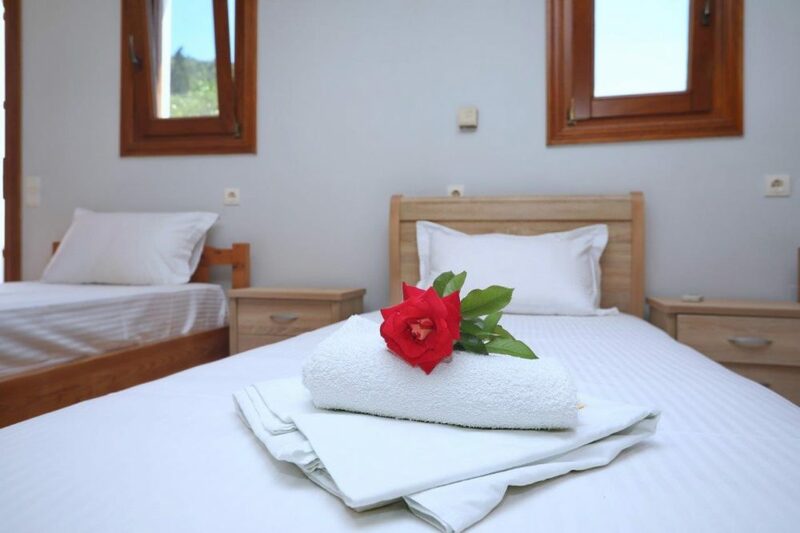 We offer cleaning of the swimming pool every second day ( early in the morning 6,00 am in order not to disturb your privacy), cleaning of the Villa, floors, terraces, pool space,change of linen and towels, every third day. 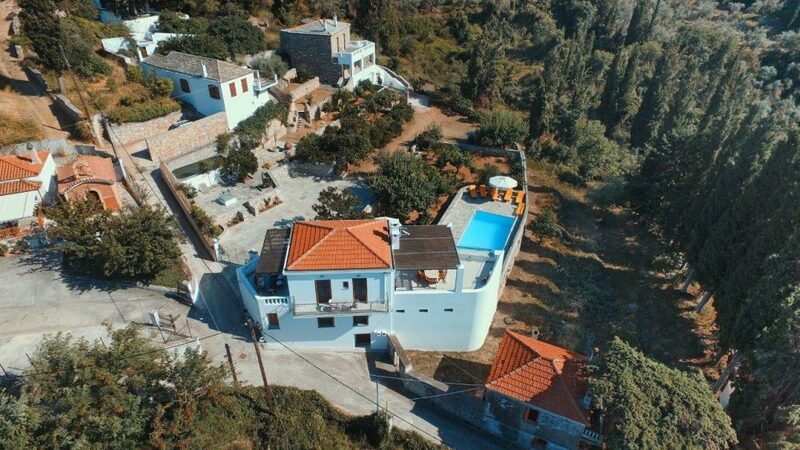 The house has a new washing machine (7kgs) for guests to use. 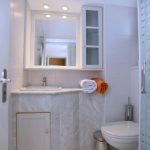 We offer free of charge, liquid soap, washing powder for washing machine & dish washer, cleaning liquid for dishes, coal, gloves, utensils, matches for barbecue. We are stand by 24/24h, in case you have any problem with the house or health problem. 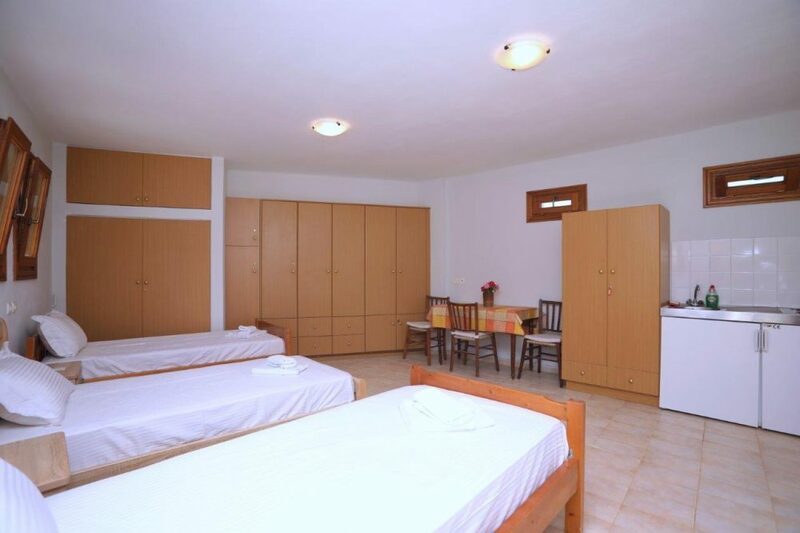 We have technical staff stand by (cleaning lady,gardener, plumber, electrician). 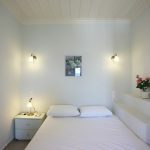 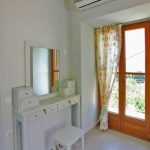 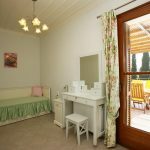 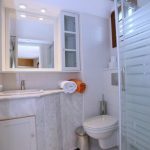 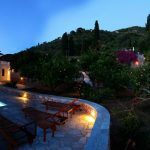 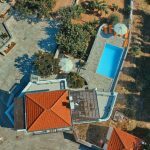 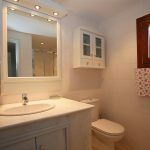 You may call free of charge all over Skopelos.You have 24/24h free phone connection with the owner. 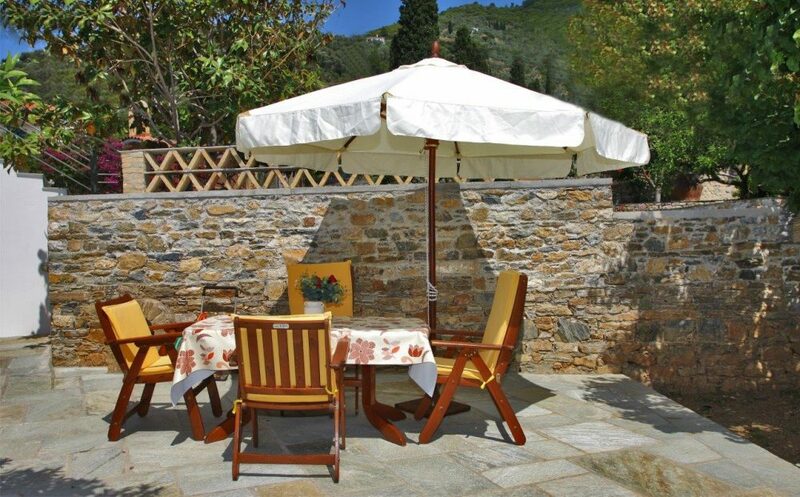 In order to protect the house from sudden storms, it has an anti-thunder protection system which protects all the electric appliances (including laptops) from the sudden increase of the electric power (V) due to thunders. 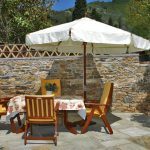 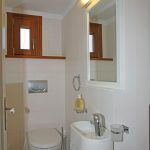 Our aim is to feel at Villa Orange at home, in total privacy and discretion .The private garden of Villa Orange of 2200 sq. 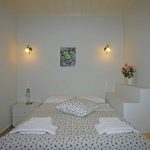 is totally clean to walk bare foot!and to taste bio farming vegetables and fruits. 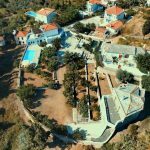 It is secure for children and all fenced with an entrance with telecomand and it is is full of orange, lemon, bergamot (citrus), abricot, koumkouat, kiwi, mandarin, grenadier, peach, apricot and olive trees. 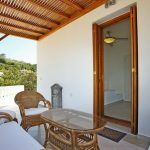 The land has also bougainvilliers, hibiscus, roses, magnolias and many other aromatic plants.You have high speed wi-fi throughout the garden and the pool.In the house you will find a list of recommended restaurants, tavernas , bars to visit and site seeings, beaches to go. 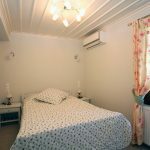 There are 3 bedrooms, one for a couple on the ground floor with a double bed(1,31X1,90), one on the first floor for a couple with a double bed (1,50X1,90) and one children room on the first floor next to the master bedroom with a sofa which becomes 2 single mattresses of (0,80X2,00) each,one mattress next to the other.The children room can host two children aged less then 17 years old.All linen, towels are new and top quality. 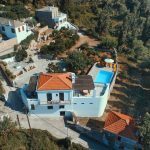 All equipment in the villa is new.Swimming pool cleaned every second day and cleaning of the villa, terraces, pool area every third day. 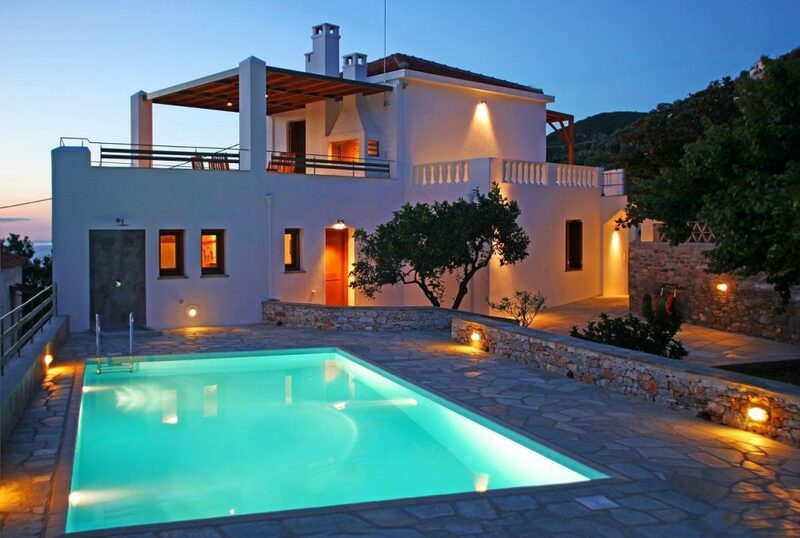 Departure from the villa should be not later than 9:00am. 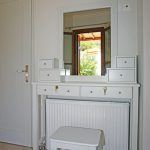 Arrival possible at 16:00pm.